Just yesterday (November 7, 2016), Jean-Henri Schÿler, owner of this Bordeaux third-growth, Château Kirwan, and négociant Maison Schröder & Schÿler passed away at age 85. The Kirwan name actually has Irish roots (from the Gaelic meaning black). In the mid 1700s, an Englishman bought the Château and his daughter married Mark Kirwan of Galway. Although he was beheaded during the French Revolution, the name stayed with the estate. Jean-Henri’s father bought the Château in 1925 and as a result, Jean-Henri had been involved with it since he turned 22. He married Christine Krug (yes, that Krug) and their 2 daughters still work at the Château, while their son is the current CEO of Maison Schröder & Schÿler (founded in 1739 the company shipped spices, sugar cane, olive oil and wine from Bordeaux to the Baltics. Ships brought back oak for making barrels). We purchased this bottle at the BC Bordeaux release in 2010 and opened it last week to celebrate a milestone birthday. On the eyes, it is a beautiful medium plus shade of ruby going garnet, while the nose shows blackberry and blackcurrant layered over light tar and leather, with baking spice and leather glove. The palate is dry with mouthwatering acidity and gorgeously evolved and strained tannins – just enough grip for the beef we paired it with. Flavours show deeply ripe blackberry and blueberry with pencil shaving, leather glove, oak and an elegant minerality. WSET Very Good, complex and layered and could last 8-10 years more (until 2026), although we celebrated with it at 7 years old. 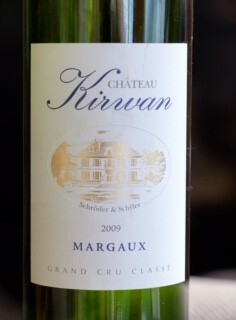 This entry was posted in Cabernet Franc, Cabernet Sauvignon / Blends, France, Merlot, OTHER, RED and tagged 2009, Bordeaux, Château Kirwan, france, Grand Cru Classé, Jean-Henri Schÿler, Margaux, red wine, third growth. Bookmark the permalink. I have a bottle of this one and will now enjoy it even more now that I know the backstory. Thank you Llama! Hi Francine! I remember getting up at 4am with you, Brian and Don to attend this release! Yes, it’s a delicious drink – ready to enjoy…Maybe perfect for some election return watching! ?